How to Jack-Up a Rover P5 or P5B. There’s a recent blog-post on the Rover P5 Club Forum (see here) about how to correctly jack-up a Rover P5 or P5B. I thought this was such an important topic that it was worth noting here. Buy a quality jack (a trolley jack is best) and good quality axle stands, rated appropriately for the vehicles weight (as a minimum). Never rely on the jack to support the vehicle. Jacks can collapse and aren’t intended for long-term support. Immediately the car is at the correct height, you must support the vehicle on axle stands rated correctly for at least the vehicle weight. Always work on level ground, put the handbrake on, put the car in gear (or Park if an automatic). Also chock the wheels that are on the ground. Cars can roll or move-off jacks and axle stands. Always work on firm ground (concrete preferably). Jacks and axle stands can sink into soft ground as the vehicles weight is concentrated in such a small area. Never rely on a classic cars’ factory jacking points. You have no idea what condition these are in on an older car, and jacking-points can and do collapse. Additional to the general points above, on a P5 or P5B, the factory advised that the rear axle should always be supported due to the design of the Contrasonic rear ‘Y’ bushes (that attach the rear of the rear leaf springs). These were made by Metalastic, and whilst very strong in compression and shear, can fail in tension (e.g. when the rear axle is hanging from them). Some modern workshops use hydraulic lifts that do not support the tyres and axle – be aware of this when taking the car in for any work. The front subframe is generally very strong, as is the front suspension, so there are no special issues here. Take note of the bullet points above, then place the trolley jack under the front crossmember (there is a flat plate welded to the subframe front cross-member, directly underneath the radiator) that is an ideal location for the jack. Raise the car to the required height, then place an axle stand under each side of the sub-frame, and gently lower the car onto the axle stands. The exact location that is best will depend somewhat on the model – the P5B has a slightly different subframe design compared to the P5. 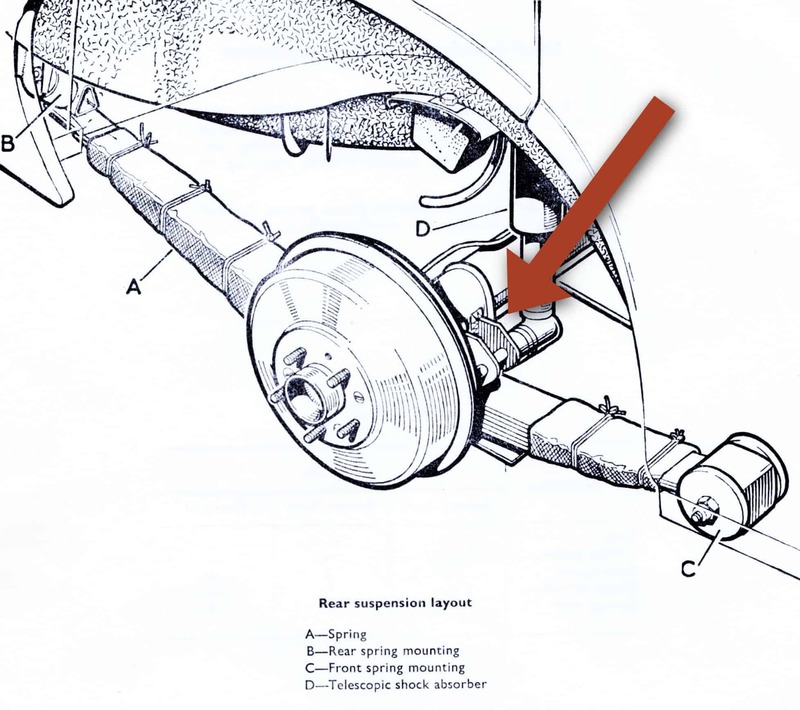 Find a location where the subframe is horizontal and parallel to the ground in order to ensure the axle stands don’t slip out from under the car. Lock the axle stands in position if they have such a feature – ‘ratchet’ type axle stands in particular should have this feature. Unless it will be in the way of you working, I then lower the jack a further 1cm so it is clear of the subframe and leave it in place, just in case. It isn’t under any load, but may help in the extremely unlikely event that the axle stands fail. As noted above, the rear of the P5 or P5B needs to be jacked-up carefully, with the axle supported at all times. The best approach is to place the trolley jack under the rear differential and jack the car up from there. The differential housing has a drain-plug on the bottom that may protrude, so a pad on the trolley jack is recommended to avoid damaging the drain plug. Jacking-up the car in this way keeps the axle supported at all times. Raise the car to the required height, then place an axle stand under each half of the axle, just inside where the rear leaf springs clamp the axle (the large ‘U’ bolts) and gently lower the car onto the axle stands. Lock the axle stands in position if they have such a feature – ‘ratchet’ type axle stands in particular should have this feature. As at the front, unless it will be in the way of you working, I then lower the jack a further 1cm so it is clear of the differential and leave it in place, just in case. It isn’t under any load, but may help in the extremely unlikely event that the axle stands fail. Recommended location of the axle stand under the rear axle (one side only shown). With the correct precautions and considerations, jacking-up a Rover P5 or P5B should be very safe and shouldn’t damage the car, particularly the rear suspension bushes. As always though – if you’re unsure of anything, get expert advice or leave the work to a professional.